After Monday's decline, the Russell 2000 benchmark is now down 20 percent from its all-time high hit in late August. Small caps had outperformed their large peers earlier in the year on bets that domestic-focused companies would be immune to the trade tensions. "Small caps are riskier than large caps, and there are some concerns about the end of a cycle in the U.S. and that we are entering a recession," said Tobias Levkovich, chief U.S. equity strategist at Citi. Shares of U.S. small-cap companies officially entered bear market territory Monday. The names are the most sensitive to fluctuations in the economy and market sentiment because of their small size, and could signal larger caps would soon join them. "The sell-off comes from the risk-off sentiment. Small caps are riskier than large caps, and there are some concerns about the end of a cycle in the U.S. and that we are entering a recession," said Tobias Levkovich, chief U.S. equity strategist at Citi. 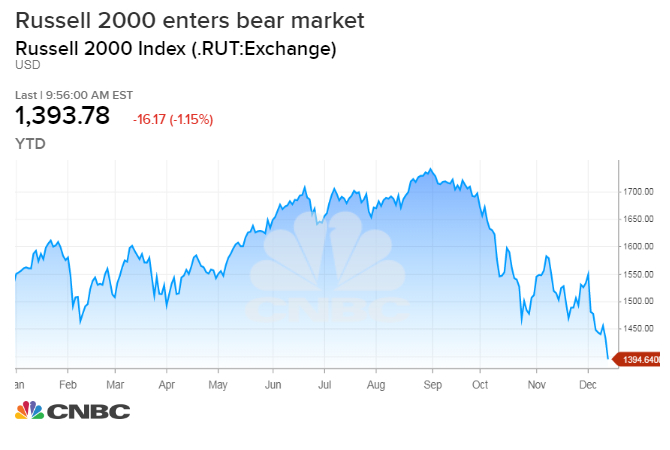 The Russell 2000 index fell 2.3 percent Monday, bringing its loss from a record in late August to more than 20 percent. The benchmark reached its the lowest level since August 2017 on Monday, continuing a sell-off triggered by worries on a slowing U.S. economy. The recent sell-off in small-cap stocks is a sharp reversal from their outperformance earlier this year. Small caps had benefited from bets that small, domestic-oriented companies would be immune to the trade tensions between the U.S. and China and benefit most from the U.S. tax cut. But rising rates and increasing costs on things such as wages ultimately dented the appetite for smaller companies, along with an overall risk adverse sentiment. The rally seen earlier this year might have been overdone, Levkovich pointed out. The companies in the S&P 500 index have about 72 percent North American sales, while small-cap companies in the Russell 2000 have 77 percent domestic sales, he said, so it's not like their insulation from the trade war was that much greater. "It's not quite the differential as you think. Also your sales might be here, but your product component might be sourced from another place that may be impacted by the trade sanctions," Levkovich said. The rise in interest rates is also weighing on small businesses' performance, according to Peter Boockvar, chief investment officer at Bleakley Advisory Group. "The problem is that small-cap stocks have more leverage than large-cap stocks and people are beginning to focus on balance sheets. About 40 percent of the debt on small-cap balance sheets is floating rate, and the increase in interest rates raises the cost of capital for a lot of small-cap companies. Next year will continue to be a tough year, " said Boockvar.